Pieced using the Missouri Star Quilt Company pattern "Katie's Quilt", this cheerful quilt is just the thing for a dorm's extra long bed or a full sized bed top. 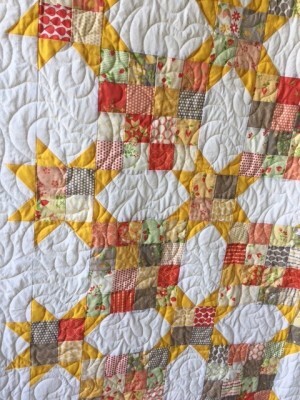 It is made from the Moda "Sundrops" fabric line of sunny colors and prints. 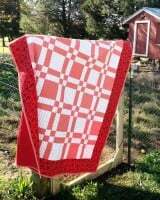 It is quilted professionally by a long arm quilter in an all over pattern. 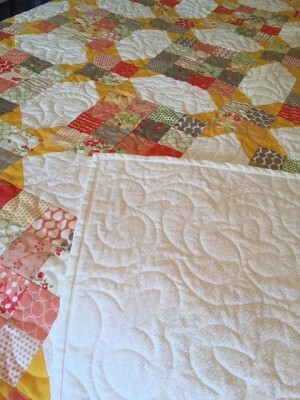 The backing and binding are a soft tone on tone white in a fern pattern.